An impromptu poll on Mocorunning's facebook page solicited over 20 responses and countless thumbs up from Mocorunning fans on Monday night. Less than 24 hours prior to the meet, a little bit of hype began to surround the too-close-to-call RM vs. B-CC girls matchup in Candy Cane City, USA. If you aren't a fan of Mocorunning on facebook, you are missing out on part of the Moco track/xc experience. The race lived up to the hype in every possible way. The expected front runners Ava Farrell of B-CC and Elena De La Paz from RM took off at a blazing pace. The first mile was in 6:00 as the two had already separated themselves from the field. Farrell accomplished her goal to be first into the narrow wooded section and set the pace around a winding wooded trail loop. However, when she got the chance, De La Paz pushed into the lead and created separation from Farrell. De La Paz shocked fans and parents when she emerged from the woods with a sizeable lead over the favored Farrell. Farrell kicked hard around the final loop and closed the gap considerably but came up three seconds short. De La Paz earned her biggest cross country victory in 20:00 while Farrell finished closing hard in 20:03. Between 21:07 and 21:47, four Richard Montgomery girls crossed the finish line and four B-CC girls crossed the finish line. Fatima Resendiz of RM outkicked Claire Cohen of B-CC for third place giving RM the advantage through the first four runners. Fifteen seconds later, Caroline Leuba and Laura Nakasaka of B-CC beat out Emma Tolerton and Abby Titmas of RM. The advantage swung to B-CC through eight runners. Susannah Derr sealed the deal for B-CC with a ninth place finish. 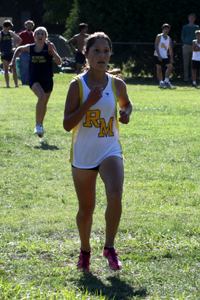 Genesis Porquin of RM had a hard kick to beat out Alison Thomas of B-CC for tenth place, but it was not enough. B-CC won 26 to 29. 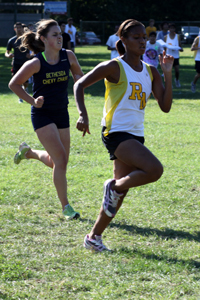 De La Paz said she primarily knew about Farrell from running with her at the Chevy Chase Running Company summer group runs, another part of the Moco track/xc experience that everyone should join in on. She was surprised with her winning performance today. Farrell said that is was not a very good race for her but was really excited for her team. The B-CC boys put up a good fight against RM, but with one of their top five runners out with an arm injury, their #5 runner today was too far out of the race. 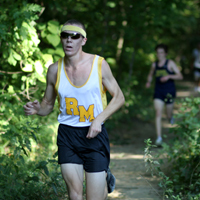 Like Farrell, B-CC's Eliot Gerson wanted to be first into the narrow wooded section and pushed the pace early on. RM's Sam Martin chased after him and noted that Gerson was pushing him pretty hard. When Gerson opened a small gap, Martin realized he wouldn't be able to just relax and pushed back up to Gerson. When he had the chance, he took over the lead for the return trip to the finish area. "He timed his kick so perfectly," said Gerson of the 4:21 miler Sam Martin. Martin won in 16:42 while Gerson finished second in a personal best 16:47. Gerson, who had a pretty good kick himself, credited healthy hamstrings for the newfound speed at the end of the race. He struggled with hamstrings all of last year. He also explained that his implosion at the Magruder Invitational last week was due to cramps. B-CC actually put three guys in the top five with Trevor Stephens in third and Philip Caterrall in fifth behind RM's David Hamilton in fourth. But RM put six in front of B-CC's fourth runner and an additional four guys in front of B-CC's fifth man. The final score was RM with 26 and B-CC with 32. 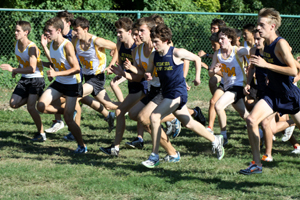 Both teams will race on a very different course at the Bull Run Invitational this Saturday. Congrats to Elana! Thats a big win against an amazing opponent! Keep putting in the work.